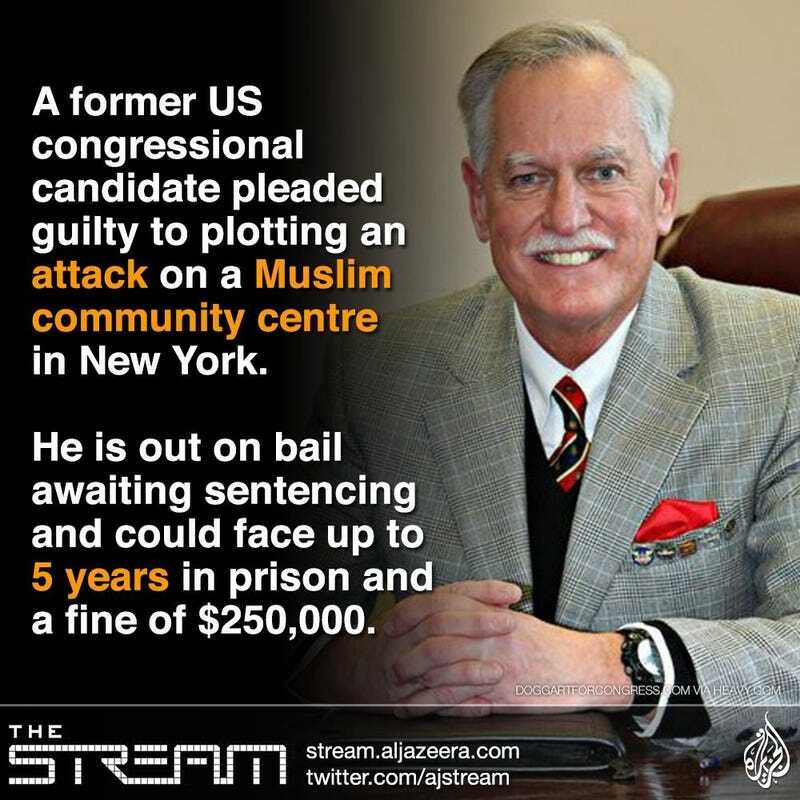 Robert Doggart, a 63 year old former independent candidate for the U.S. Congress, has pled guilty to one count of interstate communication of threats after planning an attack on a Muslim community centre containing a school and a mosque in Hancock, New York. Doggart was apparently far enough along in his plot to have met with members of an unidentified South Carolina militia group. The FBI became aware of Doggart after he made threatening Facebook posts, referring to the Hancock area as “Islamberg” and stating that it needed to be destroyed. The FBI also discovered maps of the Hancock area, and literature on gun laws in New York State. He also spoke to an FBI informant about how to make Molotov cocktails. Over the objections of the FBI, Doggart has been released on bail to await sentencing. WTF? He was planning to destroy a school and they let him out on bail? I don’t care if he is under electronic surveillance, this guy sounds nuts enough to try to attack someone before he goes to jail. This is insane. Eta: Apparently Islamberg is a real place. It was founded by in the 1980’s by a Pakistani Sufi Iman but is mostly made up of African American Muslims. The community has a good relationship with neighbouring communities. There was a video that claimed it is some sort of terrorist training camp, but there is obviously no real evidence of this. Also, Sufis tend not to get involved in terrorism.